Senior Research Fellow Prue Cormie from Edith Cowan University Health and Wellness Institute with participant Gerd Schmidt. Mounting evidence shows that integrating exercise into cancer patients’ health plans is hugely beneficial in helping people tolerate treatment, contribute to recovery, as well as prevent its recurrence. Research over the last 10 years has revealed physical activity is associated with lower overall mortality for men diagnosed with prostate cancer¹, a reduction in the risk of colorectal-cancer and overall mortality in those diagnosed with stages one to three colorectal cancer², and the reduction of the risk of death from breast cancer³. According to these studies, patients don’t need to go overboard, with either the duration or intensity of their exercise. Oncologist Dr Daphne Tsoi from Oncology West says the degree of benefit for a small amount of exercise is so profound, it is often comparable to treating cancer with chemotherapy drugs. “People with cancer can significantly improve their survival chances with just 30 minutes of walking per day, more if they are able,” says Dr Tsoi. To speed the recovery of her patients, Dr Tsoi signs them up for an exercise program specifically designed for cancer patients run by the Edith Cowan University Health and Wellness Institute. Senior Research Fellow Dr Prue Cormie, from the Institute says she sees, firsthand, how exercise can impact the health of people with cancer. “Exercise can have a huge impact on peoples’ lives by counteracting both the physical and mental effects of cancer treatment,” says Dr Cormie. Exercise helps manage fatigue, relieve distress, decrease anaemia and improve immunity. It may also lower the risk or severity of lymphoedema. If you would like to start an exercise program, ask your GP to refer you to the Exercise Management Program for the Treatment of Cancer at Edith Cowan University Health and Wellness Institute. They have six exercise clinics throughout the Perth metropolitan area and can also design home-based exercise programs. 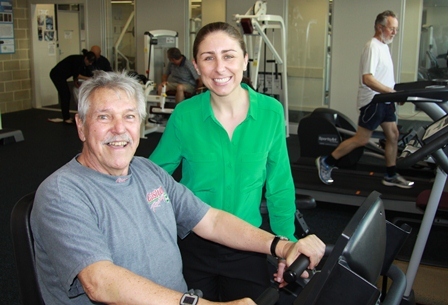 “A team of exercise physiologists who specialise in working with cancer patients will work with your doctor to tailor an exercise program to suit your specific needs,” says Dr Cormie. Oncology, Volume 29, Number 6, February 20, 2011. Activity and Survival After Colorectal Cancer Diagnosis.